Around the same time her father sent the article, ishigo had started becoming involved in activism and community leadership, helping to organize her first protest of 150 UCI students who demonstrated against Islamophobia on campus. As a student government leader, ishigo already was working to help make sure Muslim students were being treated fairly on campus, and after learning about her own family history, the connection between the past and the present brought social justice issues even closer for ishigo. 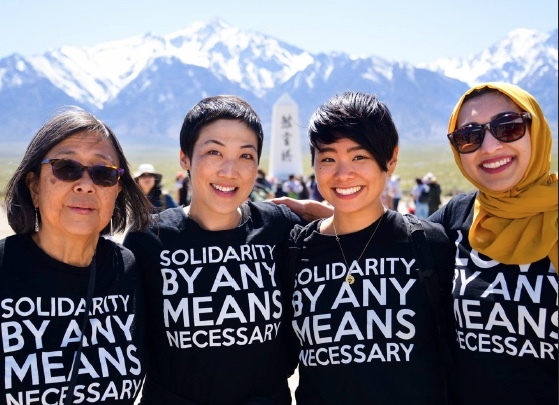 Four years later, after the San Bernardino shooting, she helped form an organization, Vigilant Love, connecting Japanese Americans and Muslim Americans in solidarity against backlash and fear towards Muslims. 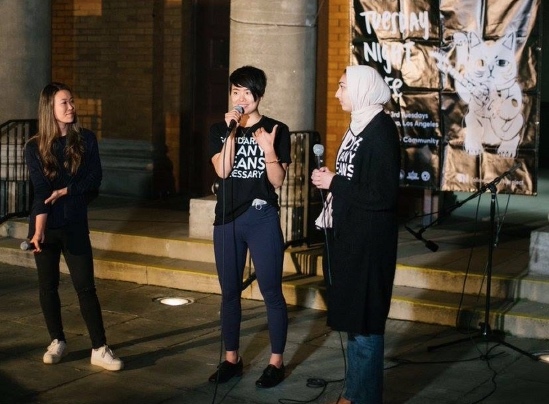 The organization was formed with Sahar Pirzada, a Muslim community organizer, and supported by established Japanese American activists Kathy Masaoka and traci kato-kiriyama. Together they put together a community vigil in Little Tokyo attended by 400 people to grieve for the victims of the San Bernardino shooting as well as show solidarity against backlash towards Muslim Americans. However, ishigo felt she had a calling beyond her community activism. She saw first-hand the increased anxiety and depression for those affected by oppression and violence. With this in mind, she enrolled in the Master of Social Work program at the University of Southern California in the Adult Mental Health and Awareness Department. Now ishigo is able to integrate her psychotherapy training with her community work. 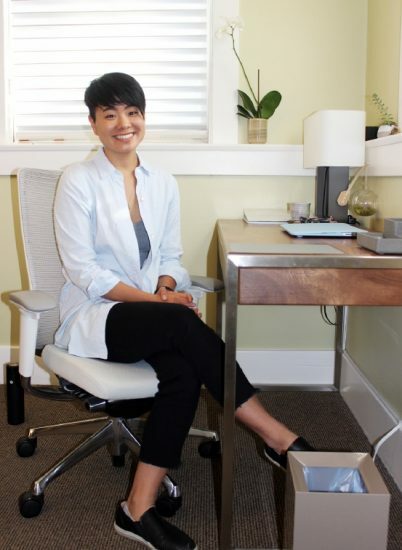 Recently she launched her own practice, Webs of Well-being, which will provide one-on-one therapy at an office in Pasadena as well as consult with community organizations on how those they serve are impacted on a mental health level by everything from political events to systemic oppression and support them in creating programs and finding resources to address these needs. “The work we do as individuals connects to work we do as a community,” explained ishigo on the importance of attention to mental health for community organizations. It’s not just ishigo’s attention to inclusivity and activism that sets her practice apart, but also her skill set in alternative approaches to mental well-being such as meditation and yoga. After her father used zazen meditation to help with his tinnitus, ishigo, already brought up in childhood in Jodo Shinshu Buddhism at the Hongwanji Buddhist Temple in the San Fernando Valley, began studying it at the Japanese American Cultural and Community Center. A lifelong basketball player, ishigo happily discovered the benefits of yoga in college, years after a heart condition sidelined her from continuing to play sports during high school. For yoga, ishigo trained at The Tree in South Los Angeles, a studio and training center she found especially useful for the communities she wanted to serve. 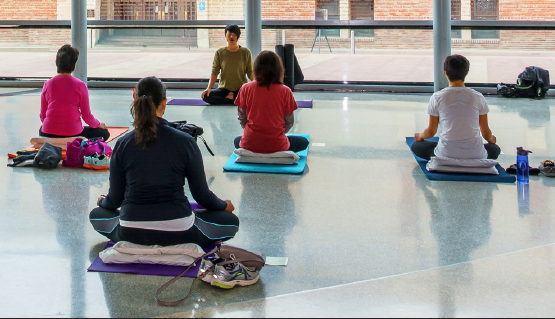 While completing internships as part of her MSW program at the Anti-Recidivism Coalition and Downtown Women’s Center, she led classes in trauma informed yoga, stress reduction and mindfulness. She also brought her yoga teachings to AF3IRN, a transnational feminist organization, for their School of Youth Activism Summer Program and a trauma-informed yoga class to the Center for the Pacific Asian Family, a domestic violence organization. Aware of the importance from something as large as a protest to as everyday as helping to give a mother time for herself, ishigo’s commitment to helping others spans the spectrum. However, she quickly connects how all the variety of efforts are not necessarily separate parts of her practice, they actually can go hand in hand. Trauma victims can disassociate from their bodies upon experiencing a “disregulating trigger” — something that recalls their trauma. Although the work is still relatively new, ishigo recalls hearing about trauma based yoga sometime in her undergraduate years, the physical work is believed to possibly help people go deeper into talk therapy work. As ishigo experienced in her personal life, it sometimes takes time for a person to feel ready to share their story. Although she and her father enjoyed a closeness in their relationship for talking about politics and current events, nothing was ever said about their family history. Inokichi Ishigo, her great-grandfather, was sentenced to one year of hard labor on and Island in Hawaii and a $1,000 fine for the possession of two Japanese flags, one in his home and one at the Honomu Henshoji Mission, a Buddhist temple of which he was president. “I like to think of his leadership at a Buddhist temple as cultural activism,” said ishigo with a small smile. Activism set ishigo apart in her family. Her parents felt that protestors were troublemakers, and though she felt freedom and respect in her household to voice her differing political views, she never swayed her parents on any matters, political or domestic. While attending a protest against the University of California Board of Regents’ 32 percent tuition increase during her freshman year of college, her interest in activism began. While heavily involved on her own undergraduate campus, ishigo branched out further, attending a leadership conference for Japanese Americans on her own. There she met politically progressive Japanese Americans for the first time. The experience helped form relationships with organizations and people that are part of the foundation of her work today. As a therapist and community organizer, ishigo sees therapy as applicable to both communities and individuals. A redress movement can be therapeutic for a community; a therapist can help a client define how they want to live their life. Now with the launch of her own practice, Webs of Well-being, ishigo is here to bring a truly multi-faceted approach to what will no doubt be a lifelong career in helping people, and communities, to heal. Nikkei Progressives will host Webs of Well-being at 341FSN for an official launch event from 4 to 6 p.m. on Saturday, Nov. 10, at 341 E. First St. in Little Tokyo. The event will feature a meditation, presentation on ishigo’s background and approach, poetry by traci kato-kiriyama, snacks and non-alcoholic refreshments.